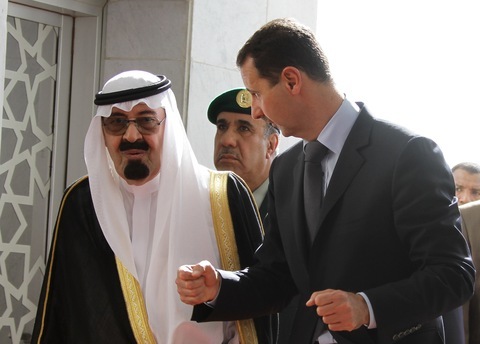 The sight would have come as a surprise to most Lebanese just a few months ago: King Abdullah of Saudi Arabia and President Bashar al-Assad of Syria, emerging from a plane together at the Beirut airport Friday and being greeted by Lebanon’s political leaders. In the country’s fractious — and often confounding — political stew, Syria and Saudi Arabia spent most of the past five years backing competing factions. On the one side, the Saudis, along with the Americans and Europeans, were major supporters of the March 14 Coalition of Saad Hariri, son of the slain former Prime Minister Rafik Hariri. The group’s major rallying cry was for Syria, which had a military presence in Lebanon for 29 years, to pack up and leave. Soon after the senior Hariri was killed in a car bombing, and hundreds of thousands rallied in downtown Beirut against Syria, Assad pulled his soldiers from the country — though some critics say they never truly gave up their hand there. Syria’s ally, Hezbollah, is the most powerful institution in the country. More so than even the Lebanese military, analysts say. The fear that the results of the investigation could lead to sectarian strife in Lebanon has led many of its earlier backers to fear its outcome. Even Hariri’s son, the current Prime Minister Saad Hariri, has toned down his anti-Syrian rhetoric. He’s visited Syria on four separate occasions since taking office last November and Hezbollah sits in his governing coalition. If either of them are implicated in his father’s murder, no doubt it will be difficult to continue the rapprochement. Friday’s joint visit is also unique since it is the first time the Syrian leader has been in Lebanon since the Hariri killing. Some analysts say it shows Syria’s influence in the country is on the rise. All this probably makes Hezbollah a bit nervous. No doubt, much of the talk today will be on managing whatever fallout may arise from indictments in the Hariri probe. Hezbollah doesn’t want to be left out to dry. That’s one reason, analysts say, for Nasrallah’s speech last week. According to Goksel, Hezbollah is under pressure like never before. The tribunal, which was set up by the U.N., has not made public statements about the status of its investigation. But according to at least one person who has consulted with them, Hezbollah — or people close to Hezbollah — is the prime target. And indictments could come as early as this fall.